"I don’t know if there was a day we didn’t think he would make it. He approached everything the right way and treated people the right way,” says Lance West, University of Alaska Fairbanks’ Nanooks head bench boss. The University of Alaska Fairbanks’ men’s hockey program knew exactly what they were getting – both on and off the ice – in Colton Parayko. Lance West, head bench boss of the Western Collegiate Hockey Association’s Nanooks, was an assistant coach with the men’s hockey team when he first met the defenceman from St. Albert, Alberta. He recalled being immediately impressed with Parayko. “The first thing that stood out about Colton was how professional and humble he was as a person,” remembered West, a former centreman who starred at the University of Alabama-Huntsville. Parayko could also play the game. In three seasons at Alaska Fairbanks, he was named to the All-Western Collegiate Hockey Association First Team in 2013-14 and 2014-15. In 104 games with the Nanooks, he recorded 66 points. “Right away,” said West, noting when the hockey staff realized they had a genuine talent in Parayko. “We had seen his development prior to coming here and felt very fortunate to have him. The thing that always stood out to me was how well he used his stick. He just defended with his stick so well. I also thought offensively that he had a good stick, too. He could really shoot the puck. Passed over the first time he was eligible for the NHL Draft, Parayko, who also wasn't selected in the Western Hockey League Bantam Draft, was taken by the St. Louis Blues in the third round (No. 86) in 2012. 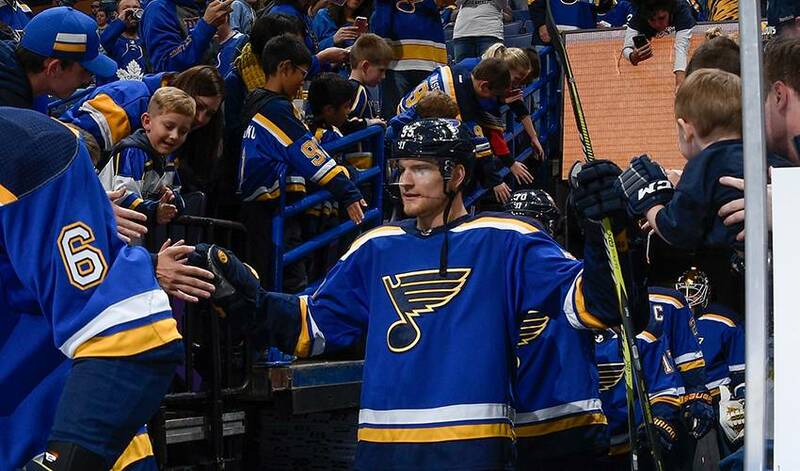 After he signed an entry-level contract with the Blues in March of 2015, Parayko joined Chicago of the American Hockey League for 17 regular-season and five Calder Cup Playoff games in 2014-15. The blueliner earned a spot with the Blues in 2015-16 and led NHL rookies with a plus-28 rating. Parayko was second among rookie defencemen with nine goals, 24 assists and 33 points and was named to the NHL All-Rookie Team. None of that has changed 195 games into Parayko’s big-league career. Although he isn’t wearing Nanooks colours any more, the 24-year-old still has strong ties to the program and his former coaches.